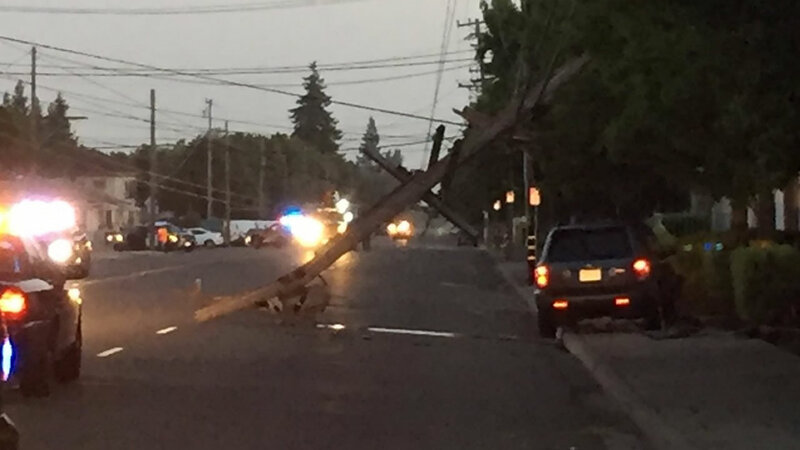 HAYWARD, Calif. (KGO) -- PG&E has restored power to all but 50 customers in Hayward after a hit-and-run driver took out a power pole at the intersection of Hathaway Ave. and Lansing Way early Friday morning. The area has been closed off while crews work to restore lines. This happened around 5:15 a.m. The driver lost control of his car and slammed into the power pole. He knocked it down and took wires into the street as well, police say. Police say they're talking to a man they believe is the driver. ABC7 News did see them giving a man a field sobriety test. PG&E shut off power but they say it's still a dangerous situation while they work to re energize the lines. They want to keep people out of the area and are redirecting traffic. There were initially 4,000 customers without power after the crash.